You often hear dogs look like their owner. I was wondering about that very question myself and, wondered if it was actually truth to it, if there were any scientific proof/view for that. Also,I wondered if people choose the dog that looks most like themselves unconsciously. According to BBC news article written by David Robson, Michael Roy at the University of California, San Diego was one of the first psychologists to put the idea to the test. He went to three dog parks, and he photographed the dogs and the owners separately, and then asked a group of participants to try to match them up. Despite no additional cues, he found that they were able to match them up with reasonable accuracy. Similar look especially with eyes seems to be one of the cue that could helped participants to match up better. The eye seem to be one of the key. According to the Huffington post article written by Dominique Mosbergen, Japanese psychologist Sadahiko Nakajima who researches on dog-owner resemblance at Japan’s Kansei Gakuin University, says there’s scientific evidence to support not just the notion that humans and their pet dogs look alike, but also why that’s so. And one of the key is the eye. Just like Michael Ray, he carried an experiment in 2009 where he ask people to match up dog and an owner simply by looking at the pictures. He reported that people were, at a rate significantly higher than chance, able to match dogs and their owners simply by looking at photographs of their faces. His findings were similar, to those of previous studies. He told The Huffington Post that the evidence from his and other scientists’ research shows that the popular belief in dog-owner physical resemblance is empirically valid. Nakajima then conducted another experiment that sought to determine if the pet-human resemblance could be traced to a specific facial feature. For the experiment, more than 500 people were shown two sets of photographs. One set showed pictures of real dog-owner pairs, while the other set had random pairings of people and dogs. The participants were randomly assigned to one of five different “masking” photo conditions: no-mask (in which the human’s and the dog’s faces were unobstructed), eye-mask (the human’s eyes were blacked out), mouth-mask (the human’s mouth was blacked out), dog-eye-mask (the dog’s eyes were blacked out), and eye-only (where just the eyes of the human and the dog could be seen). The participants were then asked to select the dog-owner pairs that physically resembled each other. participants who were shown the unobstructed photos correctly identified the dog-owner pairs most of the time. (In this case, their accuracy rate was up to 80 percent.) When the owners’ mouths were concealed, participants were correct 73 percent of the time. But when the eyes of either the humans or the dogs were blacked out, the participants’ accuracy fell to the level of random chance — around 50 percent either when the human’s eyes were blacked out, or when the dog’s were. When participants were shown only the eyes of the dog and the human, their accuracy rose to 74 percent. From this experiment, you could feel the eyes really matter to pick the correct pair of dog and the human. why do people pick the dogs who are like them? Nakajima told HuffPost that “a major reason of the dog-owner facial resemblance is the so-called ‘mere exposure effect (we human like things that are familiar. ),’” or the idea that a person might choose to get a dog who looks similar to themselves because of a preference for the familiar. To read the huffington post article, please click here. I can see people see the similarity in the dog-human pair with eyes, but people pick the dog just by similar familiar look is the only reason? When you think about it, people do not choose group of friends just by look. As David from BBC article writes, we also tend to be around people who share similar personalities too. With that in mind, Borbala Turcsan at Eotvos University in Budapest decided to test whether the same was true of our canine soulmates. Previous tests they done shown that human traits such as extroversion can correspond to objective measures of the dog’s behavior. Turcsan found that the dogs and their owners both tended to show similar personality profiles. Interesting thing is that, she found that it was actually higher than the similarity found in married couples and friends. They did not think dog has copied the personality of their owners considering the amount of time the dogs and their owners had spent living together. They thought that the personality seemed to be part of the dog’s appeal in the first place; thus result in picking up the one most compatible to you..
To read the full article written by David for BBC website, please click here. One of the article came across said women with longer hair covering their ears tended to prefer the Springer Spaniel and the Beagle, rating these breeds higher on the dimensions of likeable, friendly, loyal and intelligent. Women with shorter hair and visible ears tended to rate the Siberian Husky and the Basenji more highly on these same dimensions. I personally feel that hair would not be so much effect on selecting the breed of choice or particular dog to become one of your family member. I am more sold for eye theory and personality theory. With both theories, I would think it is good possible answer to the question why we human choose the dog who look like us. I do not know about eye similarity with Palette for me, but she has, I feel like, a bit similar personality. 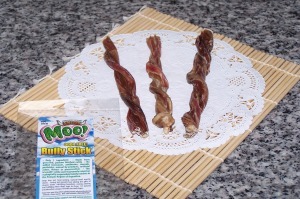 Enter the code SUMMER to take 12% off on all Grass-fed Moo!Odor Free bully sticks*. Items under bulk treats of the month are excluded from this special. Code box will appear on the payment page after typing in the shipping information. All Grass-fed Moo! Odor free bully sticks are made in Argentina. When you visit grocery stores, bakery shops, you would find variety of sweet baked goods such as Muffin. Back home in Japan, I do not remember such a wide variety of muffins or cupcakes. Especially the one with frosting because we tend to decorate baked goods with whipping cream (we don’t do icing or frosting), and melted chocolate with or without cut up fresh fruits. I find American bakers use more dye in baked goods than us, and it looks like more colorful dye art field than ours. Ours highlight the baked goods with fresh fruits a lot along with melted chocolate art and they are much much less sweet. My mother is a great baker. I remember I was looking forward to checking out the kitchen at 3 pm every day after school,which we called “snack time”. Our son’s snack time is also 3 pm and he looks forward to that time. Japanese kids grow up with certain snack time (younger ones might have 2 snack time 10am and 3pm but as they get older, 3pm is the most common snack time for kids) and those are the time family sit around the table and enjoy snack together with a cup of tea. We don’t snack throughout the day,which is good practice I think for kids. Plus our parents put some portion out for kids, and those were the amount we had each day. Portioning out is a good practice I think because we know how much we are snacking. You never know how much you had already if you were eating right out from ice cream container or potato chips bag, for example. When my mother was working, she would leave us kids a plate of portion; homemade snacks with a little note. When my mother was not working, I enjoyed watching how she make things and helped her baking cakes,bread and more. It was fun. I have had Muffin or cupcakes as a kid my mother made but, we did not have those as often as I would be having here in the states. Now I come over here in the states and experiencing all kinds of flavors and ingredients, and I found that making muffin/cupcake is quite fun playing around with all kinds of flavor ideas combining different kinds of ingredients with or without choice of liquor or wines. It is easy to bake muffin. When mood strikes, I like baking different kinds time to time. That being said, now we got Liam, I am very careful for the choice of right snack for him. Not only that, I tend to use more fresh ingredients in snack for more nutrition in mind and, I bake stuff with much less sugar. Probably sugar I use is 3rd or so of regular basic recipes of many kinds. I myself hate sticky sweet baked goods and I used to bake half the sugar or less that are calling for in basic recipes. However, I have even lessen that amount now. Still, it tastes good and having fresh fruits in it helps bringing out more taste in the baked goods. 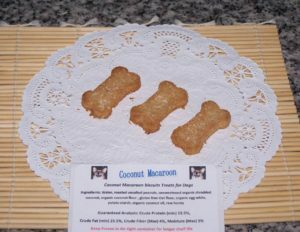 The recipe below is toddler friendly snack recipe. 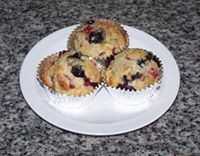 The recent muffin I made is Skinny berry berry peach muffin. I named it skinny because I used really low sugar in it. I used blueberry,raspberry and peach and it came out real good. Adults can enjoy this very much. I myself loved it too. These are not sticky sweet, dense muffin. This is the muffin filled with fruits, and they are fluffy textured muffin. When you have it next day, I suggest that you will take off the tin cup and wrap it with paper towel so it gets steamed and microwave for good 15-20 seconds.It gets fluffy textured muffin again. Skinny berry berry peach muffin..
Surf Turf Jerky is made with American fully grass-fed buffalo meat with wild-caught salmon with skin on. We do not use the grass-fed buffalo meat with grain finished. 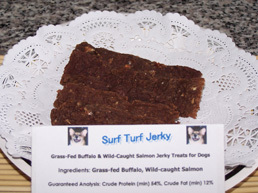 You can read more on Surf Turf Jerky in the taste testing entry titled “Palette’s note:Surf Turf Jerky”. 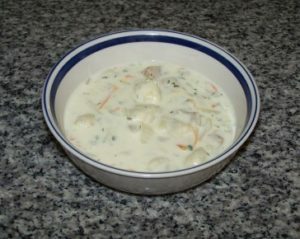 Please click here to read the entry. Surf Turf Jerky will be made to order approx. 16 hrs before shipping time,and we offer freshest Jerky on the market. Please store this Jerky in freezer for longer shelf life in your air-tight zip bag after receiving your order. 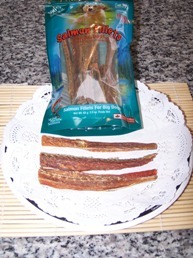 Surf Turf Jerky is lab tested,and registered with department of agriculture. Wild caught salmon biscuits made with gluten free,grain free Garbanzo bean flour.This 4oz package contains approx 15 biscuits. You can read more on Greek Biscuits in the taste testing entry titled “Palette’s note:Greek biscuits”. Please click here to read the entry. Greek biscuits will be made to order approx. 12 hrs before shipping time,and we offer freshest Biscuits on the market. Please store this biscuits in freezer for longer shelf life in your air-tight zip bag after receiving your order. Greek Biscuits is lab tested,and registered with department of agriculture. 100% dried Wild Pacific Salmon Fillet made in Canada. Salmon is great natural source of Omega3 and, Omega3 is great for skin and coat. 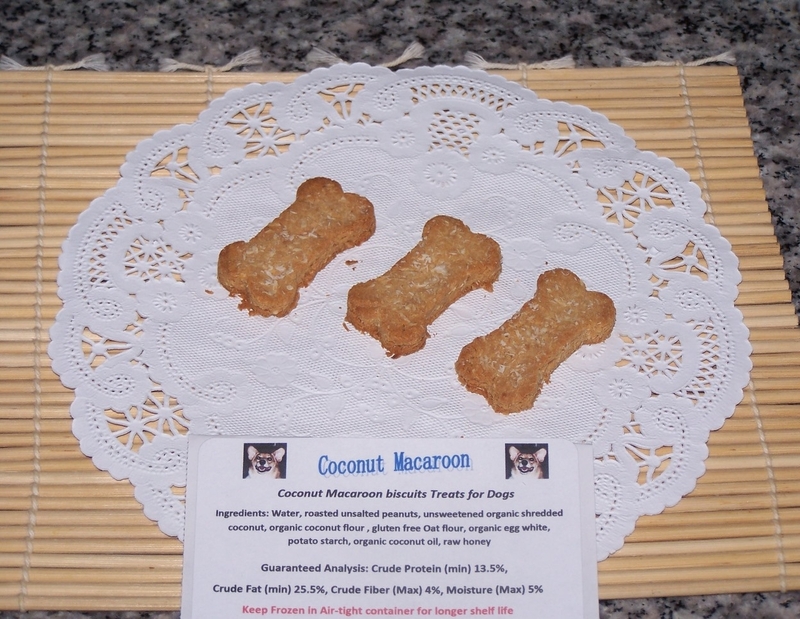 This treat is very healthy, nutrient packed treats without fillers. He could finally came home on the day 22. Now that Liam came home, our real parenting journey has begun. I find that being a parent is such a hard job but, it is very rewarding job as well. Anyway. on the day 31, he turned 1 months old. This entry is summary of 1 month old baby development. According to Mayo clinic’s “Guide to your baby’s first year”, babies loose weight from the birth weight during the first few days of life and gain the weight back and continue gaining weight and, height will lengthen by 1.5″ to 2″. It also says that growth spurt is at 7-10 days and 3-6 week of age. Liam lost weight during the first few days since birth and gained the weight back at NICU, and continued to grow. stepping reflex: if you hold baby upright, and let his feet touches the surface, he will pick up 1 feet and then the other as if walking. Japanese e-magazine says babies at this age can hear well and they can tell which direction sound came from. Eye sight is about 0.02 and, it is about they can see the thing placed 30 cm ahead of them at best. However, they can see clearly if the item had clear color contrast. Liam had milk time every 3 hours, but I learned that at this age, you can let the babies have milk as much as they want. Goal for the feeding is more than 8 feeding times a day. My Japanese e-magazine says that by the 1 month old, amount of milk babies drink per time would increase and, breast feeding time gets shorten and lessen. It also says that average amount babies drink is as following. This is based upon formula amount. 1-3 month: 120 ml – 160 ml per time x 6-7 times and average amount of milk babies drink would be about 700 ml – 1,000 ml. Some babies drink with long interval between the feeding time. If you feed breast milk and formula, let the babies drink breast milk first and then let them drink formula about 30 ml – 40 ml if they looked still wanting to drink after breast feeding time. The feeding number is still same to formula feeding and 8 times a day is the goal. If you let the babies drink breast milk only, let them drink as much as they want and 8 feeding a day is average feeding time and mord than 5 minutes on each breast. When the babies looked satisfied with one breast then, let them drink from other side first on the next feeding session. In the case of Liam, since he was naturally did not drink as much as other babies would from the beginning, at 1 month old he was drinking roughly 450 ml – 480 ml (50 ml – 60 ml per feeding) a day plus direct breast milk from breast feeding practice time. I am not sure if other moms had done this /do this, but right from the day one he came back to our home, I started keeping food journal for Liam. Since people are not capable of remembering detail of something happened a few days ago etc.., it is good to keep track of baby’s growth with food journal like me. When questions of concerns arise, I made sure I write down on the note so I can ask our pediatrician without forgetting to ask them. This personal system worked out great for me. According to Mayo clinic book titled “Guide to your baby’s first year”, babies sleep 16 hours a day with 1-3 hours spurts. More than 70% of the day, babies spend time sleeping. The babies cannot differentiate between day and night yet and they will wake up middle of the night and asking for milk. My Japanese e-magazine says that babies pee about 15-20 times a day and they poop about 2-8 times a day. Japanese e-magazine says at 1 month, no expression on babies still. Sometimes, you look at babies and think they are smiling but this is social smile and not expression of the babies. However, they can tell you clearly when they had discomfort by crying such as being hungry, too hot etc.. They can also tell mother’s voice or smell from others and when they get being picked up and feeling “mother” via smell or sound, they feel secure. By learning about babies through magazines and books,I think I could gain a bit of confidence in raising Liam without either of our parents at our house or close by. Being a parent also made myself grow up as well. Knowing what to expect at next step is a plus and, I cherish the moment with our precious son every day. He makes me smile and I enjoy every moment with him. Kids really grow up fast right in front of your eyes! I tend to take a lot f picture of Liam’s first whatever moment. Grass-fed Moo! 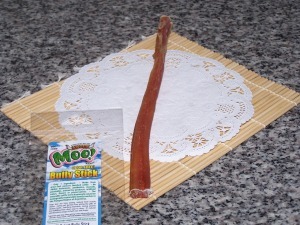 Odor free Angus beef bully sticks “Select” 11″-12″.. 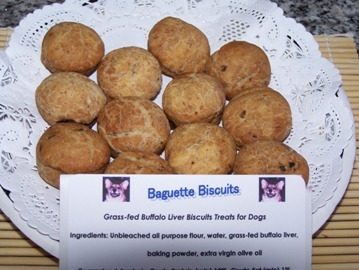 This is our buffalo liver biscuits with a little exotic twist using fully grass-fed buffalo liver. Biscuits will be made to order,freshly baked before shipping time. All will be vacuum-packed to seal-in the freshness. Let’s watch our K9 executive chef “Palette” in action with taste testing Baguette biscuits. If you are a blog subscriber, please click here to watch the video. You can read/watch more on Baguette biscuits in the entry titled “Palette’s note: Baguette biscuits”. Please click here to read the entry. Puffed USA Lamb ears made in USA. This American Lamb ear is soft texture, and it has been one of our k9 executive chef “Palette’s favorite chew since when she was a puppy. She still get this old time favorite chew as jackpot treat sometimes.